Tina from Kidz Activities is joining us today with a free printable game for you. It is really cute and I hope you enjoy it. Do you remember playing Bingo? Maybe you played this as a kid or at charity events. It’s such a popular game and it can be quite fun and exciting. So we thought of creating a simpler version of the original Bingo game for preschoolers. 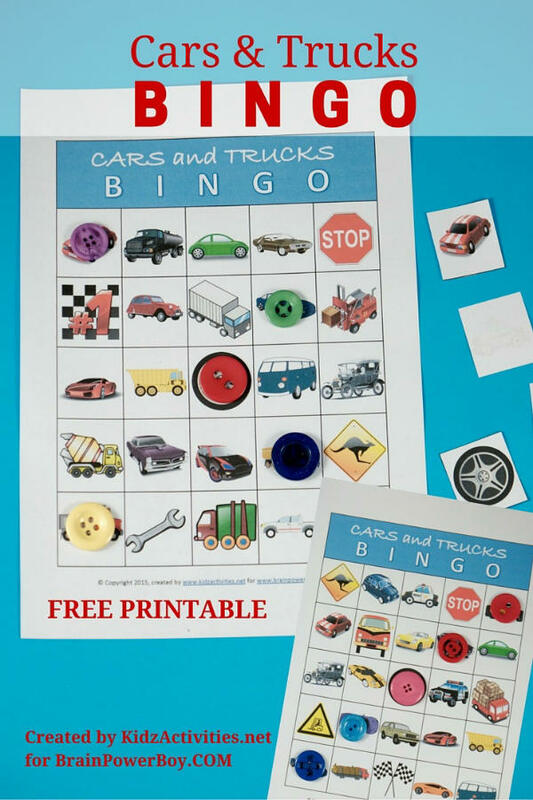 Here’s one that’s perfect for kids between the ages 3-5: a Free Printable Cars and Trucks Bingo Game created by Kidz Activities! This is a fun play based learning game. 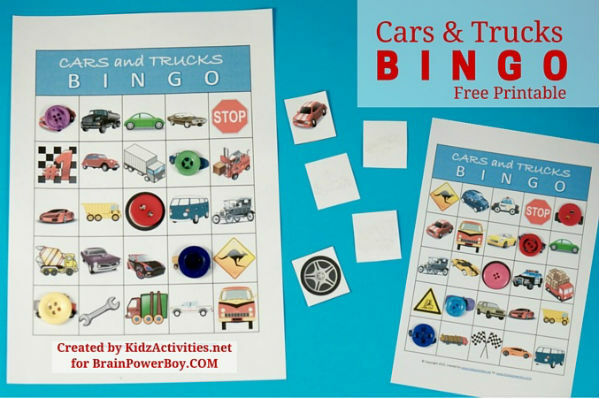 Free Printable Cars and Trucks Bingo Game <<<<<click link to download your free printable game. Pages 1-4 are the Bingo cards, given to each player. 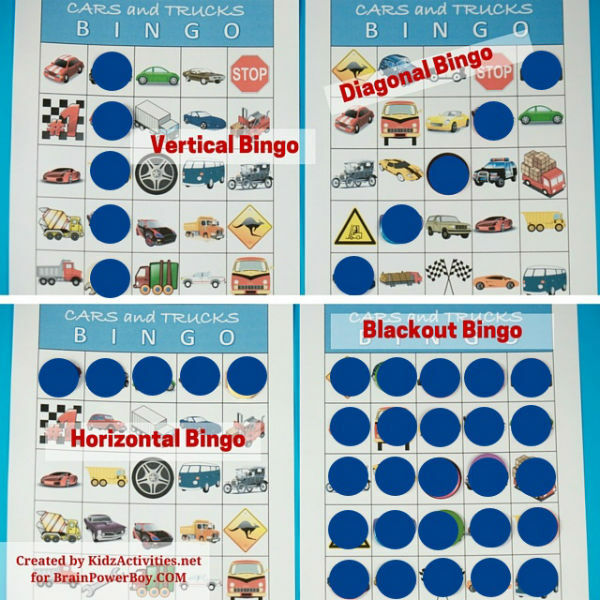 This Cars and Trucks Bingo Game can be played by 2-4 players. Give out one Bingo card to each player. Turn the Bingo calling cards upside down and mix them up. The youngest player picks a Bingo calling card. All players then check to see if the chosen calling card exactly matches an object on their own Bingo card. Those with a match put a marker on the matching object. The game continues on with the 2nd youngest player, and so on. The first player to form a line (vertical, horizontal or diagonal) wins. With older kids, you can also continue on for a blackout Bingo, which means that the first person to get all the objects in their Bingo card wins! This is the perfect game for preschoolers to play at home or in preschool. It could be a great activity for a Cars birthday party too! Kids have fun and learn at the same time. Kids learn to match objects. Perceiving the similarities and differences of an object helps preschoolers categorize things according to their color, shape, size or function. Matching is a mind exercise. It helps a child use logic, which helps with academic learning. Kids learn to take turns and interact with their peers in a fun way. It helps kids to focus and lengthens their attention span as they are encouraged to finish the game. Over 100 Fun Games for Boys! Kidz Activities is a site filled with kids crafts, art activities, play based learning ideas, kid friendly recipes, birthday party ideas and parenting tips. Through Kidz Activities, Tina shares ideas that can help parents enjoy their kids through fun, simple, inexpensive yet creative activities. Follow Kidz Activities on Facebook, Instagram, Pinterest, and Twitter! My boys are going to love this game! They both are obsessed with cars and trucks! Thank you for sharing at the #Made4Kids Link Party! Cars and trucks are pretty popular with boys I know too. I’m so glad to hear they will like it! Enjoy. Such a cute idea! Thanks for sharing at the #LearningKid linkup. Thanks Melanie – you are most welcome. A pleasure to have you on the site, Tina! I’m sure everyone will enjoy your bingo game. Thank you for making it.